In mid 2016 I did a brief tour of the west coast with Philip Jeck, Simon Scott, Daniel Mensche, Lee Bannon, Kara-Lis Coverdale, Pye Corner Audio and Marcus Fischer. The music of all these great artists and the experience of playing these shows with them all informed what would become ‘Invisible Threads’ which was primarily composed and recorded in the latter half of 2016. I had not played live at dates in such a dense cluster for many years, and the exposure to so much great music and the artists was inspiring. Other Touch artists were also an influence here - Claire M Singer, Jana Winderen and as ever Chris Watson (who has been an enduring influence from the moment I first heard Cabaret Voltaire in 1979)… along with my project ‘drøne’ with Mike Harding… the collaborative aspect of drøne brought up a few new paths in itself. During the time I was recording the album I was editing audio and sound design for films - this too went some way to defining the structure and sound of ‘Invisible Threads’. At the time of recording several of the titles on the album, I had re-read 'The Conversation of Eiros and Charmion’, a short story by Edgar Allen Poe… and in some ways this record is a soundtrack to that. The title ‘Invisible Threads’ refers to the intangible connection between all of the musical and personal influences that brought this record into being. Sound libraries from Spitfire Audio. Fender Rhodes piano, Fender Jaguar guitar. Farfisa Organ, Vox continental. Some ‘found’ sources also are present, mainly from vinyl records and YouTube. UK artist Mark Van Hoen is producing electronic music since 1981. He played bass guitar and synthesizer on the superb Seefeel’s "Polyfusia" album, one of the seminal bands of the '90s. He works under his own name and worked as well under the Locust moniker. Now he lives and works in Los Angeles. This record was composed and recorded in Los Angeles in 2016, inspired by Philip Jeck, Simon Scott, Daniel Menche, Lee Bannon, Kara-Lis Coverdale, Pye Corner Audio and Marcus Fischer, who were on tour west coast in the USA, alongwith Van Hoen. In the meantime our protagonist was recording the album he was editing and making sound design for films, which influenced the structure to the album. Several of the titles on the album were influenced by the reading he made in those days of the apocalyptic Edgar Allan Poe’s short story "The Conversation of Eiros and Charmion". Van Hoen with his modular synthesizers, sound design software, piano, guitar, organ, field recordings and library sounds, is the instrumental and sound sources that make up the seven pieces on "Invisible Threads". The strong cinematic nature of the music suggests images at all times. Ambient atmospheres transport to intimate and cozy spaces. "Opposite Day" is a good example of this, where the organ notes are suspended in the air and keep resonating. On "The Yes_No Game" emerges a female vocalist whose singing emerges from the background. "Aether" with its subtle melody conjure up composer Angelo Badalamenti. Mark Van Hoen's latest album is the result of a series of live performances with other Touch luminaries, such as Simon Scott and Philip Jeck, that he participated in all throughout 2016. This experience manifests itself in a somewhat different than expected way on Invisible Threads, because this final result is purely a solo work. However, it was these previous collaborations and performances that lead to Van Hoen approaching the record from different perspectives and with a variety of instrumentation, resulting in a diverse, yet overall uniform sounding album. While he intentionally avoided using one of his staples on Invisible Threads, vintage analog synthesizers, Mark did utilize modular synthesis throughout the record. Right from the opening of "Weathered" this can be heard: a rich bed of layered electronics set the stage as he patches in some occasionally shrill tones and a pleasantly dissonant crunch, but with a tasteful level of restraint. For "Opposite Day," he follows a similar pattern, blending mostly elegant ambient electronics with just the right amount of heavy low end vibration. Even some conventional piano sounds appear on "Aethēr," culminating in a melodic progression that continues and builds throughout the piece. The combination is one that, once a bit of dissonant ambience comes in as a contrast, makes for a rather conventional, song-like sounding piece of music. The shimmering, sustained electronics that are the focus on "Dark Night Sky Paradox" also have a nice pleasantness to them, and fits in with Van Hoen's experience doing sound design for films given the end result’s film score mood. Later, a bit of drama comes from the heavy electronics that enshroud "Flight of Fancy" and, with the piece’s dense and brittle electronics have a cinematic quality as well. Like any good album, however, Invisible Threads has some more sinister moments to balance out the more pleasant light ones. The varied electronics and processed field recordings on "The Yes/No Game" make for a different sounding piece of music, one punctuated by a sense of bleakness in its light drift. Compared to many of the others here it is a more sparse mix, but what is there carries a significant amount of emotional weight. The album closer "Instable" also especially stands out with its ghostly haunting sound. There are some large electronic swells throughout, but Van Hoen blends transient layers throughout like passing spirits, resulting in a spectral, ghostly closing to the album. Mark Van Hoen, veteran of the electronic music scene as a visit to his web site will attest, has had an extensive career as both a solo and band (Locust) member. Now entering his 50’s, he continues to explore sound and texture to create some unsettling pieces of music. Invisible Threads is his latest solo work. Informed by a love of Edgar Allen Poe and the experiences of touring with other Touch artists (see the interview below). This is a dark ride. An absorbing soundtrack to a rather hesitant night of self-examination. Cinematic in scope, claustrophobic in execution, the album opens with “Weathered” – a wide-screen wash of dark expectation set against a vast ebbing pulse of keyboards, half-heard voices and static interference. This mood is perpetuated by second track, Dark NIght Sky Paradox, a sound constantly threatening direction but perpetually on the edge of collapse. Anxious music. “Opposite Day” reminded me slightly of TG’s “Exotica”, water and bird sounds mix with chimes to gently soothe. The Yes_No Game is suspended tones and a lone, lamenting female voice. Think Eno, with a Beth Gibbons being recorded at the far end of a very long corridor. Aether is a simple keyboard (not synth, Van Hoen is at pains to point out) that reminded me of Japan’s “Voices Raised in Welcome, Hands Held in Prayer” , but heard through a fug of low-level sonic interference. Again, at no point can one relax with this music. At least, I couldn’t, It’s not Ambient. It is suffused with an unyielding, unrelenting dread and demands to be faced head-on. Reckoned with, almost. Flight of Fancy is anything but. Nothing is playful and all of it unsettles. Don’t play this to chill-out to or mollify dinner guests. It will set people’s teeth on edge and may actually make people a bit angry. I love it. This is an excellent release from Touch and despite my anxious emotional reaction to it, I’ve found myself returning to it frequently over the past few days, perhaps finding within its structure and sounds a suitable soundtrack to these dark, strange and frightening days. Bravo, Mr Van Hoen. Bravo. 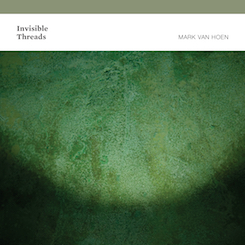 Touch releases the latest adventure by Mark Van Hoen just today (25th May 2018), its called Invisible Threads (CD/Digital). Let’s attempt an unveiling as I need to play catch-up since his last record I experienced was 2012’s amazing The Revenant Diary. Starting with the top track Weathered, the mood is strangely symphonic, light crackle and hiss over an otherwise moody, darkened mid-range synth drone. It’s pure aural theater from the start. The foreground actions are minimal while the back is bold and shape-shifting, with a random radio frequency throwing practically inaudible voices that are assimilated into the mix. Dark Night Sky Paradox continues without the tail end, and adding a slightly higher pitched tone creating a bit of an alarm. This feels like an extended overture in suspension. This has inflections of his past work throughout, but Van Hoen has matured in his editing, and paring down any excess, keeping each track here packed with drama. The air is goosepimple inducing on Opposite Day. It’s part tropical forest meets part space exploration, with a tinge of shadow play. He’s heading into the world of independent soundtrack scoring in the foggy space created on The Yes_No Game. Strident synths, lapping waves and bare whispers become space age symphonic. This blend of unyielding artful restraint is also indicative of label head Jon Wozencroft‘s ghostly green coverart, like a found object from another galaxy. Moitié de drøne aux cotés de Mike Harding, Mark Van Hoen dit avoir puisé l’inspiration pour Invisible Threads, dans l’énergie créatrice des artistes avec qui il a tourné en 2016, ainsi que dans celle des artistes du label Touch. Invisible Threads est une oeuvre étrange et envoutante, aux climats presque mystiques, avec ses orgues et ses synthés décrivant des cercles habités de field recordings naturalistes et de zones urbaines fantomatiques. On est happé dans un monde que l’on imagine du bout des oreilles, capable de se faire presque imperceptible. Mark Van Hoen compose des ambiances sombres sans pour autant être pesantes, laissant la lumière passer au travers d’interstices minuscules, desquels s’échappent en catimini des bourdonnements frêles. Climatique et cinématographique dans son ensemble, Invisible Threads tire presque parfois vers des ambiances expérimentales aux arrangements classiques, avec ses cordes et ses cuivres en fond, flirtant avec une certaine idée du divin et du profondément émotionnel. The Revenant Diary feels like a long time ago now: perhaps because it was. Six years is long time (although Mark Van Hoen has released two albums as The Locust in between). And yet, it continues to haunt me in some way. Returning with Invisible Threads, Mark Van Hoen continues to explore ominous, shadowy territories. This is a dark, immersive work. I’d had a tough – and very strange – day at work. Oftentimes, when weary, stressed, dazed, I will select an instrumental work as my review project for the evening, as I find I can simultaneously write and relax, allowing the sound to wash over me. It transpires that this may have been precisely the album – or not, depending on perspective – for the occasion. I say, staring blankly. Not really listening, not really engaged, and certainly not typing. Not thinking, and not doing anything else. I don’t know exactly how long I remained like this, to all intents and purposes, immobile, in a sort of fugue state. On returning, and attempting to remain focused, I find Van Hoen’s dark, churning sonic nebulae every bit as arresting and distracting. The album’s inspiration stems from multiple sources, not least of all Edgar Allen Poe’s short story The Conversation of Eiros and Charmion which he re-read while on tour. The album is in some respect designed as a soundtrack to this, but equally, the Invisible Threads refers to the intangible connection between all of the musical and personal influences that brought the record into being. In truth, the context and background have only limited effect on the reception. The reception is pure: a direct engagement between sonic output and listener. Low, humming, hovering tones undulate across the album’s seven subtle compositions. Creeping, interweaving, fragmentations of light dance across these cold, bleak expanses which often bleed together. Even the silence between seems to provide an integral part of the listening experience and contributes to the shape of the overall arc of the album. It’s distinctly background but in a way that fulfils that criteria of ambience that affects and colours the mood rather than being sonic wallpaper, disappearing into the background unnoticed. Repeated listens to Invisible Threads have not lifted my mood: instead, I feel claustrophobic, tense, weighted by an indefinable oppression. I give up: my critical vocabulary is as exhausted as my mental state when faced with this album at this time. I take a shower. Reflect. Accept that perhaps this work is so immersive that I am, temporarily, drowned. After an enlightening and enriching tour with a number of Touch luminaries, Mark Van Hoen channeled his inspiration into the pieces that would become Invisible Threads, which have been layered up out of a mass of modular synthesis, sound samples from records, domestic life and YouTube, various instruments, and computer processing. The resulting seven tracks create an extremely immersive soundworld all of its own, despite its many crucial roots. CD on Touch. Former Seefeel member and sometime Locust -- as well as having tucked numerous productions in his own name under his belt -- Mark Van Hoen continues his long line of detailed, often intense ambient electronic albums with Invisible Threads. In the twenty-plus years he’s been making music, Van Hoen -- stellar himself, of course -- has kept some equally illustrious company; of late, on a string of live dates stretching back to 2016 he shared a stage with Philip Jeck, Simon Scott, Kara-Lis Coverdale and Pye Corner Audio. Those experiences seem to have played a part in his continuing evolution; elements of sound design and techno influences have filtered in so that individual parts are increasingly granular and would probably bear inspection under a microscope, should we have the time. I couldn’t possibly do this album justice by summarising it as ‘pretty drone with dark ambient undercurrents’. In other words, there’s a lot going on and there are many depths beneath the surface. You can probably ignore the ‘Danger’ and ‘Hidden Currents’ warning signs, though. It’s a perfectly safe and enjoyable swim; also, Mark is a trained lifeguard, which helps. Waves of sound -- in both the literal and metaphorical senses -- wash over the listener to create a feel of ebb and flow; it’s an immersive as well as fluid listen. The track ‘The Yes_No Game’ is a good example of this, as a woman’s voice, previously obscured, periodically emerges as the swells subside; it’s a call, an invitation to plunge into the waters. I could happily listen to this track alone on repeat for hours… ‘Opposite Day’ starts gently with some pleasing dissonances, sub-aquatic rumbles of bass and some delicate strums and harmonious chimes. It’s all very pleasant but don’t expect to be lulled into slumber; there be darkness here. Sweet, reassuring darkness. Per Mark Van Hoen il graduale ritorno a pieno regime sulla scena sperimentale non è stato la rivendicazione di un posto riservato, quanto piuttosto la risposta a una necessità di fare tabula rasa e ripensare radicalmente le modalità espressive già adottate con profitto a cavallo tra i due secoli. In seguito alla riedizione in doppio Lp di “The Last Flowers From The Darkness” (Touch, 1997), a ridosso del suo ventennale, il sound artist londinese ha lavorato a ben tre dischi in tre anni con Mike Harding, co-curatore di Touch, per il progetto-laboratorio Drøne (“Reversing Into The Future”, “A Perfect Blind”, “Mappa Mundi”). A quest’ultimo e a molti altri sodali si ispirano e sono dedicate le composizioni confluite in “Invisible Threads”, titolo riferito propriamente ai sottili legami e alla comunanza di visioni artistiche che si instaurano tra autori di simile sensibilità ed estrazione culturale. Composto e registrato nella seconda metà del 2016, l’album del ritorno su Touch prende notevolmente le distanze dalle tematiche (post)apocalittiche degli umbratili concept a nome Drøne, inserendosi piuttosto in quel filone ambient che negli ultimi anni ha visto un notevole ampliamento dei suoi accoliti, facenti capo a label indipendenti più o meno storicizzate quali Room40, 12k, Dragon’s Eye e Cyclic Law. Van Hoen cita esplicitamente influenze vecchie e nuove, su tutti Chris Watson e Philip Jeck – le brumose stratificazioni sonore di quest’ultimo sembrano suggerire il mood di diversi momenti – ma anche due più recenti conferme al femminile, Jana Winderen e Claire M Singer, le cui affascinanti intersezioni con la scrittura neoclassica e il field recording portano avanti onorevolmente l’inestimabile eredità Touch. Tenendo fede alla sua formazione da producer, Van Hoen gioca a carte scoperte elencando anche la strumentazione, i software e i materiali sonori cui ha attinto: una varietà di elementi dosati con sapienza e misura tali per cui nessun brano somiglia ai precedenti, nonostante prevalga nettamente un’atmosfera fluttuante e contemplativa (“Weathered”, “Opposite Day”), quando non di assoluta pacificazione spirituale (“Dark Night Sky Paradox”). Solo in “Flight Of Fancy” si addensano sinistre nubi in forma di bordoni vibranti, mentre laddove coesistono chitarra e tastiere pare di ritrovarsi nel limbo cosmico dei Natural Snow Buildings (“The Yes_No Game”); “Aethēr” simula la più delicata delle orchestrazioni per archi, e nel finale “Instable” le ondulazioni dell’organo rievocano di sfuggita i miraggi del “Solaris” tarkovskiano. Mark Van Hoen, quite renowned under his alias Locust and a founding member of Seefeel, returns with the first release under his own name on the legendary label Touch in more than 20 years. Invisible Threads is a cohesive collection of tracks made after touring around the West Coast of USA with artists like Philip Jeck, Simon Scott, Daniel Menche, Lee Bannon, Kara-Lis Coverdale, among others. It’s also inspired by other Touch artists and by his collaborative project Drøne with Mike Harding. The album is deep and emotional, with sustained strings and textures floating around in a shady, spectral way on the opener ‘Weathered’. A more drone aspect on the echoes of the fading ‘Dark Night Sky Paradox’, and the layered and meditative ‘The Yes_No Game’. You can also feel nostalgia on the evoking ‘Aether’, one of our favorites, which also includes hints of a piano and makes you want to play it again and again. But then it can also get darker and more heavily loaded, like on ‘Flight Of Fancy’, which is reiterative, expanding and rising on its intentions. But same as the last mentioned song might sound thicker, the closing title ‘Instable’ can also feel thin in a way, with recurrent wind-like sounds unleashing digital howls that yearn for a time that might have not existed. A more oneiric vibe can be perceived on the calm ‘Opposite Day’, which forms melodies over a bass sound that roots back to the earth. Field recordings of what seems to be falling water and outdoor sounds complete the palette. 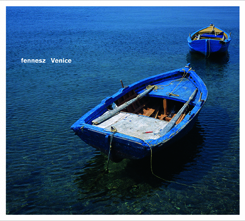 No analogue synthesizers were used on this album, which is a rare circumstance on Van Hoen’s recent recordings. Και τι είναι η μουσική αν όχι ένας μαξιμαλιστικός τρόπος απόδρασης από τα βασανιστικά οχτάωρα της καθημερινότητάς μας; Μιλάμε για αυτό το σύντομο ταξίδι που λέγεται μουσικό άλμπουμ, το οποίο, ενώ διαρκεί συνήθως λιγότερο από ώρα, αφήνει το σημάδι του μέσα σου για αρκετό χρόνο παραπάνω. Η απαρχή του ταξιδιού, όμως, γίνεται από την πλευρά του πομπού-δημιουργού και εδώ ο Mark Van Hoen διαθέτει το know how με βάση και την πολυετή και σημαντική πορεία του, η οποία περιλαμβάνει μεταξύ άλλων τη θητεία στους Seefeel, τους Scala, τους drøne και το προσωπικό του σχήμα Locust. Ο ήχος πάνω από όλα, θα λέγαμε κοιτώντας τα παραπάνω ονόματα, και ομολογώ ότι το νέο του άλμπουμ στην Touch σε μεσαία ή χαμηλή ένταση περνά ως αδιάφορο, χαμένο στον σωρό παρόμοιων φαινομενικά μουσικών κυκλοφοριών. Σαν να βλέπεις μια παραλία από μακριά και να λες μέσα σου ότι, εντάξει, μοιάζει σαν τόσες άλλες που έχεις δει. Όταν την πλησιάσεις, όμως, ανακαλύπτεις στοιχεία πανέμορφα και πρωτόγνωρα, τα οποία ήταν καλά κρυμμένα από την αρχική απόσταση. Όταν μάλιστα βουτήξεις στα νερά της, είναι ακόμη πιο χορταστική η εμπειρία, ανοίγοντας όλες τις αισθήσεις σου μπρος στον βυθό της. Πιο συγκεκριμένα, το Invisible Threads αν και φαντάζει αρχικά ως κάτι στατικό, εντούτοις είναι ένα ξεκάθαρα μελωδικό και πολύχρωμο άλμπουμ, όπου υπάρχει ένα υποθαλάσσιο ρυθμικό στοιχείο που δίνει μια ενέργεια στο υλικό του. Κάπως σαν να δημιουργείται ένα ρήγμα ενδιάμεσα των σφριγηλών ήχων και να αναδύεται ένα μπουκέτο ανθών. Με δυνατά την ένταση και κλειστά τα μάτια, η ονειροπόληση είναι δεδομένη. Είναι τόσο δε γεμάτο το άλμπουμ με τα αόρατα samples, τις γλυκές αφηρημένες νότες και την άμπιεντ αιθαλομίχλη του, που είναι δύσκολο να περάσει απαρατήρητη η νοσταλγική του διάθεση. Νοσταλγία με δυναμικές, θα την έλεγα, καθώς οι ήχοι σε πιάνουν για τα καλά και το όριο μεταξύ σκότους και φωτός προστατεύεται ευλαβικά προς όφελος άγνωστων από τα πριν συναισθημάτων. Présent très épisodiquement sur ces pages (deux albums chroniqués ici, parus en 2010 et 2012), Mark Van Hoen en retrouve le chemin par ce nouveau disque, publié sur Touch et pour lequel il nous indique avoir été influencé par plusieurs artistes avec lesquels il a fait une tournée : Philip Jeck, Simon Scott, Marcus Fischer ou Kara-Lis Coverdale. Avec ce compagnonnage, on se trouve logiquement face à un album plutôt ambient, marqué par un travail de qualité sur les nappes, allant chercher des matériaux à la limite du field recordings, et des apports vocaux féminins un peu évaporés. Pour celui dont on connaissait des travaux plus electronica-pop ou plus rythmés, il y a là l’exploration d’un univers autre dans lequel il opère avec une belle allure. Comme souvent avec ce registre musical, la superposition des plages de synthé confère une dimension très lumineuse, proche du scintillement (Dark Night Sky Paradox). Signe du talent de Mark Van Hoen, ce même aspect lumineux et scintillant, tel un miroir dans lequel se refléterait le soleil, émane d’un morceau nettement plus dépouillé comme Opposite Day. I legami invisibili cui rimanda il titolo – Invisible Threads – del nuovo album di Mark Van Hoen, uscito a fine maggio su etichetta Touch e ispirato al racconto di Edgar Allan Poe Conversazione di Eiros e Charmion, fanno riferimento ai rapporti stretti e agli scambi intercorsi tra il musicista e produttore inglese e un buon numero di colleghi, nuovi o ritrovati, la cui musica ha indirettamente contribuito alla sorprendente intensità emotiva dei sette brani qui presenti. Infatti, nel 2016 Van Hoen – conosciuto anche nelle vesti di Locust, progetto avviato negli anni Novanta dopo la subitanea dipartita dai Seefeel, che aveva co-fondato – ha fatto un tour della West Coast assieme a Philip Jeck, Simon Scott, Lee Bannon, Kara-Lis Coverdale, Marcus Fischer. Oltretutto cita ulteriori influenze identificabili nella musica di altri artisti di casa Touch: Mike Harding (con cui condivide il progetto Drøne), Claire M. Singer, Jana Winderen e, ovviamente, Chris Watson. Inutile, durante l’ascolto, andare alla ricerca di questa o quell’altra corrispondenza: è bene ricordare che di legami invisibili, appunto, si tratta. Stiamo inoltre parlando di un ascolto totalizzante, di quelli che non lasciano spazio alla riflessione; può sembrare ambient, ma va da sé che non lo è.
Già con le stratificazioni sostenute e tese dell’iniziale “Weather” e della successiva “Dark Night Sky Paradox” si dà l’immagine più o meno coerente dell’intero album: drone spettrali, evanescenti, ma allo stesso tempo ricchi di corpo e grana, che Van Hoen erige principalmente grazie al suo banco di moduli (accanto a software e plugin, Fender Rhodes, chitarre Jaguar, organo Farfisa e suoni trovati / field recording), tanto da poter accostare questa musica, in buona parte almeno, a quella di un Brett Naucke, tanto per rimanere nel mondo dei sintetizzatori modulari facendo un nome apparso recentemente su queste pagine. Le basse frequenze intermittenti e i carillon al ralenti di “Opposite Day”, la terza traccia, virano verso toni interlocutori, poi meditativi nella successiva “The Yes/No Game”, tra inganno dei sensi ed emozioni a fior di pelle. Le stesse che irradiano la malinconia nostalgica di “Aether” e le sue note di piano, almeno questa volta ben riconoscibili, lente e reiterate. E cosa potrebbe essere un brano intitolato “Flight of Fancy”, se non, appunto, un volo della fantasia che nella fattispecie conduce verso lande oscure e lievemente minacciose? Dopo un tour illuminante, collaborazioni importanti e l'intermezzo di due album con lo pseudonimo Locust, Mark Van Hoen fa finalmente la sua ricomparsa a distanza di 6 anni, da quell'ultimo lavoro "The Revenant Diary" (2012) che lasciò un po' tutti con la bocca aperta. Durante, Mark ha incanalato tutta la sua ispirazione dentro 7 pezzi che somigliano molto di più ad uno stato di meditazione. Stratificati da una massa di sintesi modulare, si avvalgono di varie strumentazioni e elaborazioni al computer, creano un mondo sonoro estremamente coinvolgente, tutto suo. I tagli techno del passato si sono evoluti in una sorta di granulosità molecolare e l'asciutto design dell'opera portano ad una necessaria volontà di ispezione al microscopio. Non è un semplice disco drone con oscure correnti sotterranee. Ci sono molte profondità sotto la sua superficie: una nuotata sicura e piacevole nonostante i segnali di pericolo ('Danger' e 'Hidden Currents'), perchè Mark è un bagnino addestrato ormai, che sa curar bene ogni forma di claustrofobia. Le onde sonore di "Invisible Threads" - sia letterali che metaforiche - sgomberano la mente dell'ascoltatore creando una continua sensazione di flusso e riflusso quasi catartico. Un ascolto fluido, coinvolgente; un viaggio dentro una foresta che non nasconde insidie. Il brano 'The Yes No Name' è un buon esempio in tale senso: la voce di una donna, precedentemente oscurata, emerge mentre le onde si abbassano. E' una chiamata, un invito a tuffarsi nelle acque fluviali che abitano questi luoghi paradisiaci e misteriosi. Un'oscurità dolce e rassicurante. Pericolosamente rassicurante. Le nebulose soniche e agitate sono altrettanto rapide e distraenti, infatti. L'ispirazione dell'album è impostato principalmente sul racconto di Edgar Allen Poe: "La Conversazione di Eiros e Charmion" che ha riletto durante il tour. L'album è in qualche modo, quindi, concepito come la sua colonna sonora. Considerando che si tratta di una sorta di storia dal sapore fantascientifico, che mescola mitologia e catastrofe indosserei - prima di polliciare sul play - le cinture di sicurezza. I toni bassi, ronzanti e aleggianti ondeggiano attraverso le sette composizioni sottili dell'album. Strisce, intrecci, frammentazioni di danza leggera attraverso queste distese fredde e desolate che spesso si confondono. Anche il silenzio sembra fornire una parte integrante dell'esperienza di ascolto e contribuisce alla forma dell'intero arco dell'album. L'ho ascoltato di sottofondo e con le cuffie: in entrambi i casi ha soddisfatto quei criteri di atmosfera che influenzano e colorano l'umore piuttosto che essere una carta sonora da parati che scompare nello sfondo inosservato. Ik ben geen volger van Mark Van Hoens werk. Hij was een oorspronkelijk lid van het ongeëvenaarde Seefeel en heeft mede gestalte gegeven aan hun unieke sound. Hij is toen snel solo gegaan en heeft een indrukwekkend groot œuvre opgebouwd (onder zijn eigen naam en als Locust), dat helaas grotendeels onopgemerkt is gebleven door de popgoegemeente. Invisible Threads is een uitstekende plaat om aan deze Vernachlässigung een einde te maken. Over de achtergrond van de opnames kun je lezen op de site van Touch. Waarom ik deze plaat zo goed vind is een kwestie van subjectieve impressies die haaks staan op de Zeitgeist: het is een warme, gloedvolle ambient-LP die vergeleken met wat tegenwoordig onder ambient (vaak zuivere drone-based muziek) wordt verstaan, ietwat ouderwets aandoet. Invisible Threads doet zowel aan het werk van Lawrence English als van Biosphere denken, maar herinnert ook—zij het dan ontdaan van alle pop- en rockreferenties—aan gold old shoegaze. De sustained organ sounds van de eerste track geven meteen de sfeer van de plaat aan: een bas ostinato tegen de achtergrond van een bed van synths en geabstraheerd vocalese, met lichte noise-interferentie. En dat herhaalt zich. Vervelend? Geenszins. Dark Night Sky Paradox, de tweede track, lijkt op een Brian Eno ripoff circa On Land en Apollo, en zo’n ripoff mag je me elke dag voorschotelen—als ie zo goed is als dit. Net als op Apollo Eno en Daniel Lanois een op zich duister klankenpalet met mock-country elementen van een vrolijke noot wisten te voorzien, werkt Dark Night Sky Paradox ondanks de wazige klankkleur toch uitermate transparant, en heeft het een opbeurend effect. Dark ambient dus zeker niet—en dat is toch wel wat waard, want tegenwoordig wordt in de ambient al te gemakzuchtig naar de troop van zwartgalligheid en romantiek gegrepen. De lichte belklanken op Opposite Day in combinatie met de field recordings doet wonderen. The Yes_No Game zou met wat meer vaart en drums eronder zomaar van Seefeel kunnen komen: Seefeel uitgekleed, zeg maar. Meer gedrogeerd, minder ecstatisch. Flight of Fancy daarentegen is dan weer beduidend donkerder van toon. De invloed van film soundtracks—tijdens de opname was Van Hoen ook bezig met het sound design voor films—is hoorbaar: wijds en gemoedelijk bulderend. Instable, de afsluiter, is mijn favoriet. Grootse Köner-achtige klanken die in al hun open dynamiek een omineuze bijsmaak hebben. Te kort maar prachtig. Mark Van Hoen heeft met Invisible Threads op zich niks nieuws onder de zon gemaakt, maar dat doet niets af aan het feit dat ik dit cd-tje maar blijf afdraaien. Reden genoeg om ’n in mijn lijst van 25 voor 2018 te zetten.